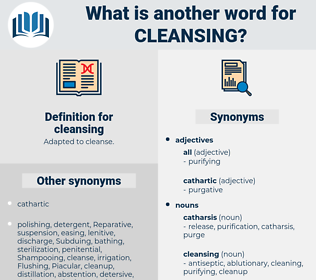 What is another word for cleansing? Lustration, Depuration, scrubbing, disinfection, degreasing, detoxification, decontamination, treatment, liquidation, clearing, hygiene, sewage, Flushing, reclamation, grooming, housekeeping. 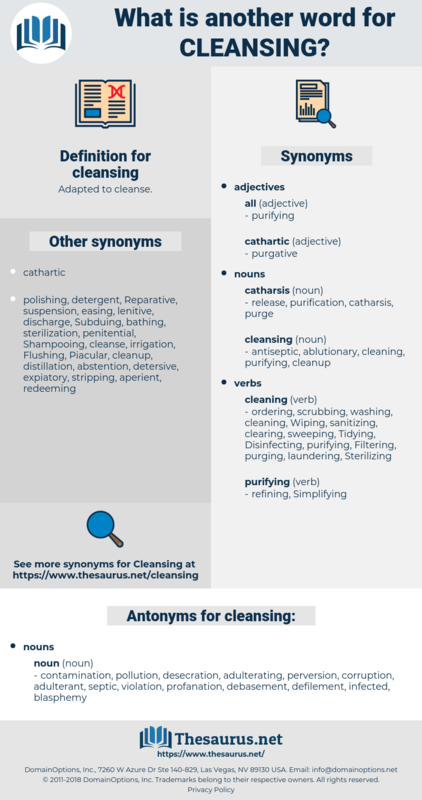 Rehabilitating, Eradicating, stabilizing, dismantling, Liquidating, scavenging, Wiping, collecting, remediating, Ridding, sweeping, Overcoming, Introducing, Treating, reviewing, Dusting, blowing, being, stripping, trimming, freeing, keeping, purifying, scrubbing, washing, clearing. purges, cleanliness, purge, washing, cleaner, extermination, sanitization, genocide. contamination, pollution, desecration, adulterating, perversion, corruption, adulterant, septic, violation, profanation, debasement, defilement, infected, blasphemy. Of the tears we shed over it the less mention the better; they are precious tears, necessary tears, cleansing tears, and if we will not lend ourselves to this Process of Christ we may have as many tears for our portion and no benefit from them in the way of advancement. That were cleansing one stone while the whole house is foul with shame.